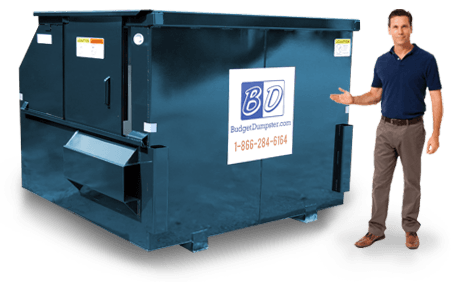 Here at Budget Dumpster, we've got the best of both worlds when it comes to waste removal. You may have heard of us, or even used us in the past when you needed a roll-off rental. But did you know that we can also take care of your commercial needs as well? That's right, if you need long-term waste removal, we can help with that too. Just give us a call and spend a few minutes of your time on the phone with one of our reps.
We're open five days a week, Monday thru Friday between the hours of 7 am and 8 pm Eastern. 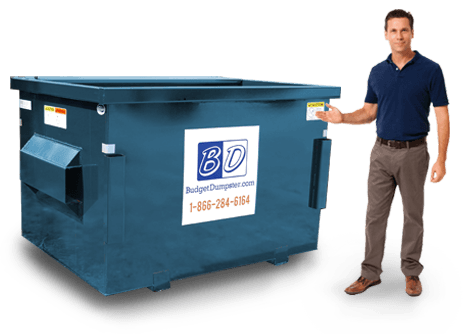 Whether you are a pro at commercial dumpsters and unhappy with your current service, or you are new to the idea, we've got what you need. Our customer service reps can handle any situation, and there's nothing they have not come across in the past. They'll ask you a few questions, and depending on your response, will be able to match you with the perfect commercial trash service for your specific needs. 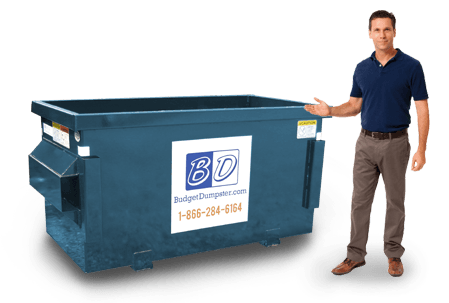 You can rent confidently with Budget Dumpster, we are the best in the business and we're ready to prove it to you. Call now to get started on a new relationship. Just because it's small, don't think this 2-yard dumpster doesn't pack a punch. It's perfect if you are working out of a storefront or your business has between 5 and 10 employees. It'll hold the equivalent of a 1 ton pickup truck and it's about 3 feet tall. This one is perfect if you are going to need regular trash pickup, but you are only working out of a space that is around 2,500 square feet. It's our most economical option in both size and price. The 4-yarder is a step up, and about a foot and a half taller when it comes to the height of our commercial dumpsters. The 4 yard option is a great middle ground when it comes to our choices. It'll hold another two hundred pounds, and with its extra height, you'll be able to toss some bulkier items in there as well. You get about twice the capacity of the two yard container, without taking up much more space. 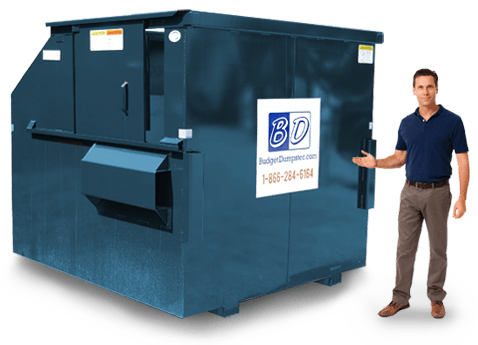 With our 6-yard dumpsters, you have a door on your dumpster, and we bet that will come in handy as our six-yarder is about 6 feet tall. The base dimensions of this container are typically 6 feet wide and 5 feet long. Use this one if you are working for a local grocer or department store. It isn't as imposing as the next size up, but it can sure hold some waste. Here's the big one, the dumpster to rule them all. The 8 yard option also comes with a sliding door, but it's about a foot taller than the 6 yard dumpster. We recommend using this one if you have a business up to 25,000 square feet in size. This is the perfect choice for warehouses and apartment complexes.